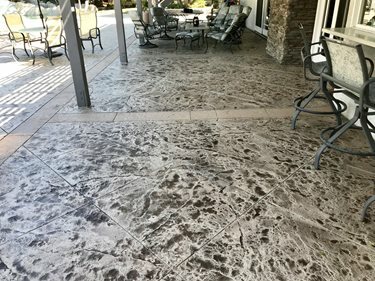 When Mike and Linda Black installed decorative stamped concrete around the exterior of their home in Norco, Calif., nearly 20 years ago, they were pleased with the natural gray-on-gray color scheme. 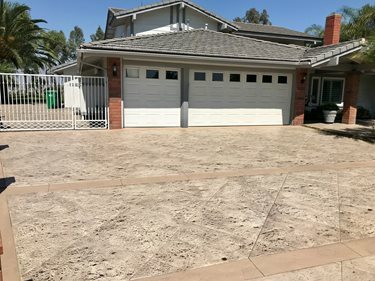 But since that time, significant advances have occurred in concrete stain technology and custom colorization, convincing them it was time to rejuvenate their existing concrete with a warmer combination of earth-toned colors that would more accurately resemble natural stone. This stamped concrete pool deck went from gray to gorgeous after it was completely recolored with various shades of water-based stain. 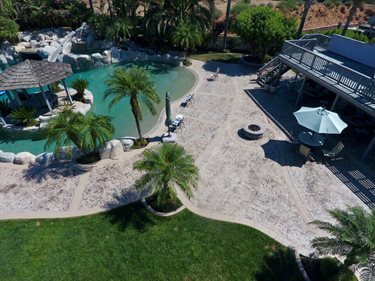 The project involved staining and resealing 13,000 square feet of concrete in both the front and back yards of the home, including a large pool deck, patio, driveway, and sidewalks. Although the original concrete was in good shape, it had to be stripped down to pristine condition before the transformation could begin. The driveway, before and after. A light cork shade of water-based stain was used to color all the stamped field areas of the concrete, and a contrasting custom color (cowboy cork) was applied to the unstamped bands and borders. A transparent antiquing stain used only on the stamped sections gives them the look of weathered stone. Once all surfaces were dry, Brown applied a topical efflorescence blocker to help prevent efflorescence from coming to the surface after it was stained and resealed. 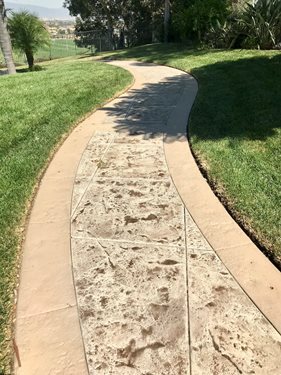 He then applied a solid-color water-based stain in a custom light cork shade to all the stamped field areas of the concrete and a contrasting custom color (cowboy cork) to the unstamped bands and borders. To give the stamped sections the look of weathered stone, he then applied a transparent antiquing stain diluted with distilled water. “Although not required, I always use distilled water to dilute transparent stains to be sure there will be no color difference from batch to batch,” says Brown. To enhance and deepen the color of the stamped sections, Brown applied two coats of a breathable solvent-based sealer. For the bands and borders, however, he used a water-based satin sealer, for both appearance and maintenance reasons. “I wanted a contrast in look from the solvent-based sealer, which is an enhancement-type sealer. 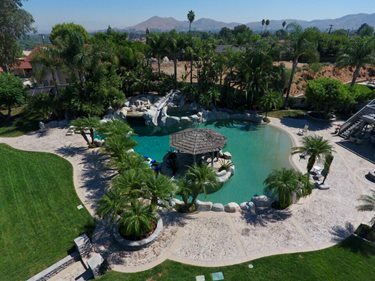 Also, because all the bands either surround the pool or are mow curbs edging the grass areas, using the water-based sealer gives us the ability to go back later and touch up or apply another coat if desired without stripping the sealer,” he says.